Join Us for the 50th Anniversary of Geosciences Celebration! 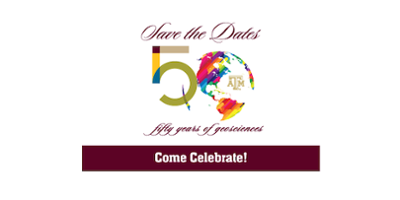 October 2015 marks the 50th year of the College of Geosciences at Texas A&M. We will celebrate the anniversary with events October 1-3, 2015. Details to follow. Although the first degrees in geology were awarded in 1930, merging the departments of Geology and Geophysics, Geography, Oceanography and Meterology came decades later. October 5, 1965, as part of the sweeping changes that Gen. James Earl Rudder instituted at Texas A&M during his tenure, the creation of the College of Geosciences became official. To commemorate the many achievements and distinctions of the past 50 years of geosciences at Texas A&M, we will host a variety of activities October 1-3, 2015. More information to come. Join the celebration as the College of Geosciences celebrates its 50th anniversary in 2015.